Susruta Samhita covera all aspects ophthalmology, ENT and head diseases, General medicine, toxicology, social and preventive medicine, pharmacology, dietary regimen and behavioural regimen in addition to paediatrics and geriatrics. 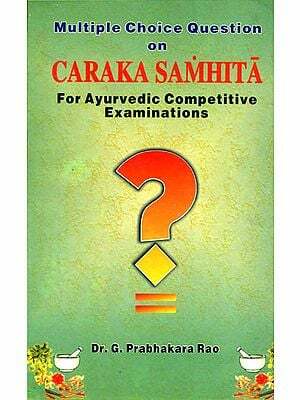 Although this Samhita is not included in the CCIM syllabus for BAMS course but it is a reference book for many subjects and also one of the Samhitas included in Brihattrayam. Consistent and considerable number of multiple choice questions are asked from this compendium many times in UPSX, APPSC, BPSC examinations and also for M.D. (Ay.) entrance examinations BHU, Jamnagar, Hyderabad, Trivendrum etc. Hence the present work has been carried out for the best interest of competitors entitled 'Precise notes and MCQs on Susruta Samhita'. This book is comprising of six sections viz. Sutra, Nidana, Sharira, Chikitsa, Kalpa and Uttara sthanas. Each section consisting of subject material and MCQs along with key, which is prepared in lucid manner by utilizing optimum experience of author for the benefit of the students of Ayurveda and those who are appearing in competitive examinations and viva voce examinations apart from final examinations in different profs. of BAMS course.